The design: a graphic language that tries to create a sense of synthetic nature within the architecture. 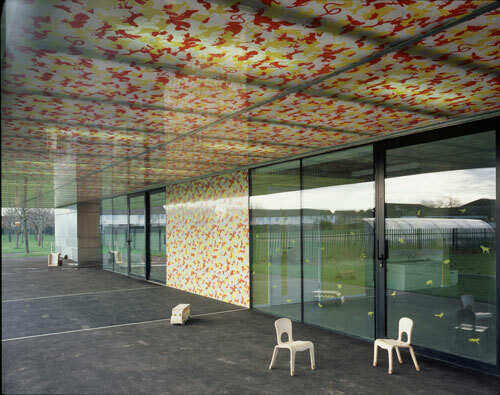 Concentrated outdoor zones around the canopies are camouflaged in a pattern made of silhouettes of local animals that change their narrative depending on the distance of the viewer to it. Applied to the canopy's ceiling and the adjacent walls it creates a sheltered outside space reminiscent of a canopy of leaves. This critical ornament is the leitmotif which is applied in a variation also to manifestation and the inside of the building with an intuitive signage that gives identity to different rooms and areas. An intended consequence is that children can re-interpret and compare the animal graphics as narrative for play and education.